With tensions between Iran and the West rapidly rising over the nation's secretive nuclear technology developments, both sides are rattling their sabers. The UN has increased banking and energy sanctions, and Iran has responded with threats to mine the Strait of Hormuz and choke off a fifth of the world's oil supply. Well, the US is having none of that. The Navy has just announced that it will ensure that the Strait remains open by any means necessary—including blowing up Iran's mines with smaller, American drone mines like the SeaFox. Built by Altas Elektrik, a conglomeration of ThyssenKrupp (the coffee maker guys) and EADS (a major aerospace contractror), the SeaFox is a semi-autonomous, single-serving UAV mine hunter. It measures roughly four feet long and weighs just 88 pounds, including the large shaped charge attached to its nose, with a range of 3200 feet and top speed of six knots. After an Avenger sweeps the Strait for potential subsurface mines, the ship's crew can simply toss a SeaFox overboard. 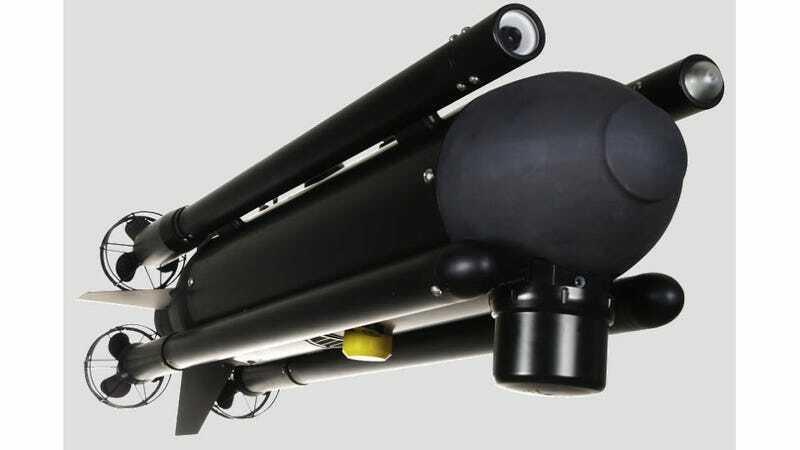 The submersible's integrated homing sonar will autonomously guide the UAV back to the underwater objects the Avenger found for further investigation. When the SeaFox approaches one of these objects, it's on-board CCTV feeds live images back to the human controller via a fiber optic line. If the object turns out to be a mine, the SeaFox (at its operator's behest) will ram the mine, detonate its explosive charge and destroy both the mine and the $100,000 submersible itself. "In the Cold War, minesweeping warfare was a large part of what the Navy did, but we have lost a lot of our minesweeping capability," said Harmer, a senior analyst at the Institute for the Study of War, told KTLA. "The SeaFox is a relatively simple, off-the-shelf system that we can put off our minesweepers but also any surface ship." The US Navy reportedly purchased a large number of SeaFoxes between February and May of this year at the urging of Marine Gen. James Mattis, the top U.S. commander in the Middle East and has already deployed them to the Persian Gulf region, along with four MH-53 Sea Dragon helicopters—which can deploy the SeaFox as well—and four additional Avenger-class mine sweepers. Pentagon officials estimate if Iran was foolish enough to try and close the Strait of Hormuz using its estimated arsenal of 2,000 mines, the US Navy and allied nations would be able to clear it in five to ten days. That's just long enough to likely cause massive spikes in worldwide oil prices, disrupt global shipping traffic, and would be tantamount to a declaration of war. "If they wanted to close the Strait of Hormuz, they could do it, but they would only be able to do it one time," Christopher Harmer, a retired Navy commander who served as director of future operations at U.S. 5th Fleet headquarters in Bahrain, told KTLA.